Marty came out on stage, looked gorgeous as always, wore the same shirt he wore in Akron, which is kind of cream color with black embroidery and leather pants and, of course, the pointiest cowboy boots around as Mike Perry said. The first show as okay but really laid back. Marty was sweating tons because it was not real cool in there, not to mention he's working hard up under all those lights. He opened both shows with "Back to the Country." He didn't do anything from the "Honky Tonkin's What I Do Best" album except for "Country Girls." It was all older stuff plus "Clyde" and an instrumental with Brad. He came back for the encore and did a number with Gary and then closed with "Western Girls." During the show, somebody yelled out, "where's your wedding ring" and his unsnapped his shirt and pulled it out. It's on the cord with his cross. He said he couldn't wear it while he was playing. I went to the lobby for the meet and greet. I tried to find the end of the fan club line which was snaking all through the lobby. Some lady said, "just get in line here, who knows where the end is," so I did. We went through the door into a little two-room area with sofas, chairs and tables. Mike's sitting on the arm of the sofa taking cards. I was talking to Mike and said something about him being Marty's road manager. Mike said, "yeah, I just stand around taking these cards." I was kidding Mike about being so laid back because he was in a really good mood. I told Deana and Tom that's how Mike makes his money. Marty pays him a nickel per card that he collects. Mike said, "yeah and then I go outside and sell 'em for a dime." We laughed, having a really good time with him. He's certainly much different than he was last year. We stood kidding for a while because the line wasn't moving fast and I said something about "thanks, Mike. Nobody else would stand this kind of abuse from me," and he said, "abuse me any time" and we all cracked up. Went in to see Marty--black leather pants and boots, white tank top and, boy is he getting tan. Got up to Marty, gave him my congrats card for the wedding, he thanked me, told him congrats on the wedding. I took a photo montage which I did of him to have him sign it and he loved it. I left the center blank with a nice piece of writing paper on it. He said, "this is really cool." He asked "where are all these pictures from?" and I told him I'd taken them. He said that wasn't what he meant. He made me go through and tell him where each shot was from and there were 18 pictures in it. It took forever and all these people were behind me. I feel kind of bad when that happens in that I'm holding them up and they're anxious, but I sure don't mind getting to spend a few extra minutes with Marty. He wasn't rushing me even though he had a ton of people waiting. I figured since he was okay with it, it was all right. I really loved it, kept talking about the shows, remembered the shows, remembered the Myrtle Beach/WV shows when I said we all followed the busses down there. He asked "what's your name again?" and I told him and he signed it "To Melinda. I love you! 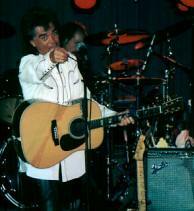 Marty Stuart." It's even legible and you know how Marty can scribble when he gets a mind to. He gave it back to me. I said "thanks" and got a big hug. I told him "congratulations" again and to be happy and he said, "I am!" and was smiling so big. For the second show, Marty had on leather pants, white tank top (tucked in now, it was out at the meet and greet which is a good thing because the pants are so tight) and the black jacket with the red embroidery. Much livelier show, the second show. Marty was loose as can be, kidding with the audience. Did more of the stuff that we've been hearing this year. 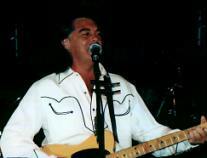 Did "Clyde" again, "Wreck of Old 97," "Long Black Veil," told about the Bill Monroe story and tribute and did "Pilgrim," talked about the new album, did a number with Brad, was kidding around, invited everyone to go skinny dipping ("I know where to do it in this neck of the woods"), typical Marty stuff...had us all laughing. Longer show. At the end of the show, he turned around and mooned the audience with his leather pants on. Marty said he'd sign autographs for anybody who wanted to wait. I got in line. It moved pretty fast. 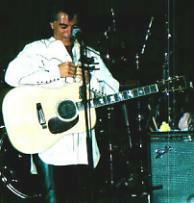 Marty had changed into the black lace-up shirt. I told him it was a wonderful show and gave him a picture to sign. Then I got bold and told him that ever since the fan club party when that woman asked if she could touch his hair, I've wanted to ask the same thing and he said "go ahead but it's all sweaty." I touched it at the side and he said, "you can do better than that." Everybody laughed. I ran my fingers through his hair and, yes, it's as soft and thick as it looks. He gave me a big hug and I said, "thanks." I was blushing like crazy. He told me to be careful going home.